Following Martha Frazier becoming a widow, there would have been little or no farming of this particular part of the land. 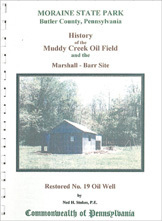 When 1891 arrived and oil was discovered on the farm next to this property, the 150 acres were leased thereafter entirely for the production of Pennsylvania Crude Oil. That industry was the governing force driving the economy of the area until the building of the Moraine State Park and Lake Arthur during the 1960s.